Ultra low-profile 757 litre hydrostatic drive dedicated spray vehicle. 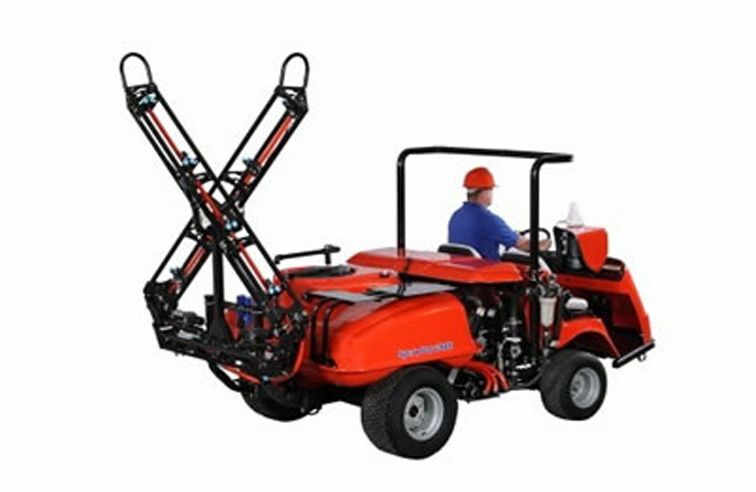 Its low-profile, mid-mounted engine design offers a low centre of gravity, excellent stability, and performance in the most demanding turf conditions. The infinitely variable hydrostatic drive, two-speed control features allow for accurate chemical application. Four spray control system options from simple electric to advanced GPS mapping systems. Hydraulic power steering controls the most maneuverable mid-size spray vehicle on the market. • High volume stainless steel centrifugal water pump with audible low pressure warning system and automatic air-bleed prime feature. • Quad-Turbo 4 jet tank agitation for accurate mixing. • Self-cleaning line strainer for reduced maintenance. • Reliable motorized ball valves for boom section control. • Optional Star Command System automatically allows any application rate, at any speed from 3.2 km/h to 16 km/h and any pressure necessary to control drift. All this is done automatically with no nozzle tip changes. • ROPS standard, twin seat design. Deluxe seat, padded, vinyl covered 1 piece molded, high back support. Adjustable operator position. Second seat with seat belt optional. Hydrostatic variable speed pump, mounted to engine, via coupler. Hydraulic power to two rear wheel drive motors. Hydraulic Steering. 12 volt battery - 20 AMPS, operator presence switch in seat. Hour meter, Speedometer, Oil Light, Speed Lock. Operator presence switch in seat for engine start, Carb-Compliant Gas Tank, Complies with all applicable ANSI, OSHA, and European Machinery Directive Standards, Roll Bar System with Driver Seat Belt. 200 gallon, low profile construction with UV inhibitors. 16” hinged lid and fillwell with built-in locking device and nylon strainer basket in fillwell. 757 litre, low profile construction with UV inhibitors. 41 cm hinged lid and fillwell with built-in locking device and nylon strainer basket in fillwell. Downstream spray system protected by “Self-Cleaning” nylon reinforced filter with return to tank and 50 mesh stainless steel strainer. Electromagnetic clutch with toggle switch at operator position, 10-70 gallons per minute (38-265 lpm) 10-60 psi (0.7-4 bar), high volume centrifugal type with silicon-carbide seal, all stainless steel body, shaft and plugs, built in low pressure warning horn to alert operator to low spray liquid level, built in automatic air bleed system for self re-priming during operation with low liquid levels, belt drive from prime mover engine. • 0.5-5 gallon per 1,000 sq. Ft.
18.5ft 11-triple nozzle triangular structure boom with tips and strainers, 12 volt powered outer section fold/ deploy. 20ft 12-triple nozzle triangular structure boom with tips and strainers, 12 volt powered outer section fold/deploy. 5.5m 11-triple nozzle triangular structure boom with tips and strainers, 12 volt powered outer section fold/ deploy. 6 m 12-triple nozzle triangular structure boom with tips and strainers, 12 volt powered outer section fold/deploy.